As you might have known I sometimes like to focus on a certain brand for a post. This time it's Lush Cosmetics. 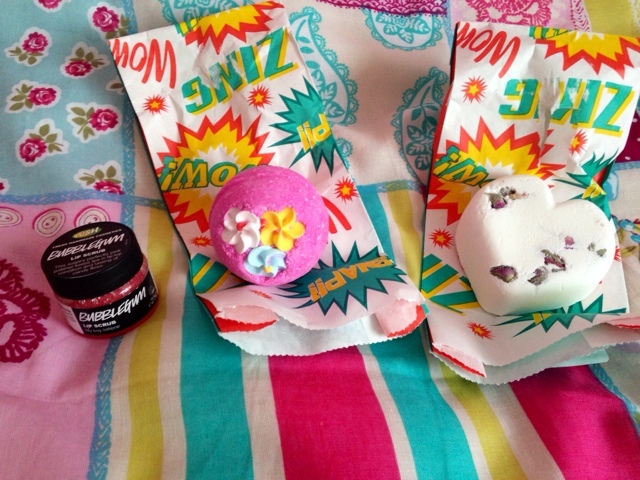 It's only recently that I've started loving their products, and I've even got my mum liking their bath bars. I've done a bit of research to find out lots about the brand, as well as bought some products for a tiny haul. Lush was founded in 1995 after a name change from Cosmetic to Go: its initial name in its first Lush store, located in Poole. One of the benefits of Lush is that it is against animal testing of their products and their ingredients. They only use volunteers to test their products, which should make you feel less guilty after a binge of bath bombs. There are lots of links with The Body Shop, as the founders (under the name Constantine & Weir) supplied for the company before going ahead with their own venture. 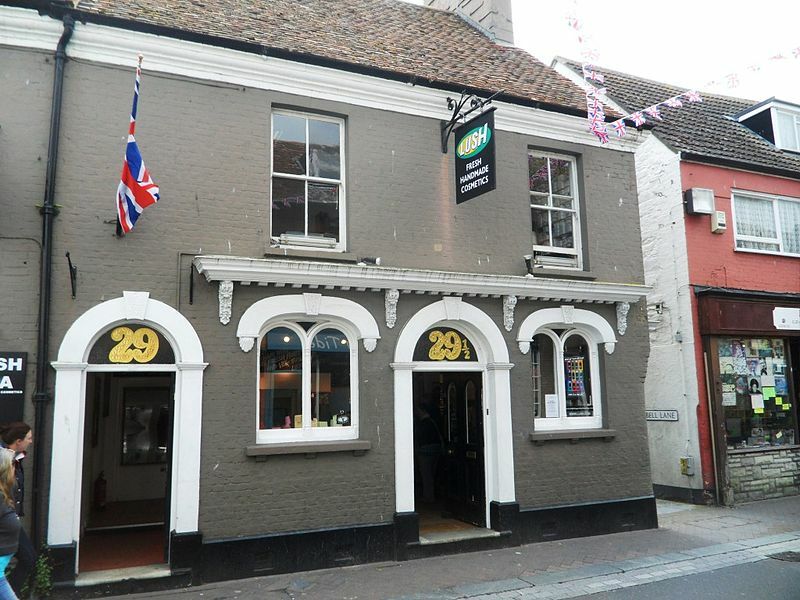 The original Lush store in Poole. Image courtesy of Wikipedia. Lush's main products are soaps, shampoos, bath bombs, scrubs etc. They have also started their own make-up collection with lipsticks, eyeliners and cream eyeshadows. Their products are 83% vegan and 60% preservative free. If you've ever bought a Lush product you will have noticed a use-by date. They ensure their products are fresh so its worth using them within the date stated so they are at their best. My favourite products are their bath bombs, and I've recently indulged in their Bubblegum Lip Scrub and Grease Lightning Spot Treatment. Last weekend, I went to the Lush in Westfield. I bought a couple of bath ballistics and the aforementioned lip scrub. THINK PINK (middle bath bomb in photo): "a relaxing pink bath bomb with a sweet vanilla and tonka fragrance." As it dissolves it surrounds you with rice paper confetti hearts that slowly melt away. I'm very excited to try it, mainly to see how pink the bath goes. TISTY TOSTY: "a beautiful-looking, delicately-scented bath bomb for when you're in the mood for romance." This bath bomb is scented with floral orris root powder, rose and lemon. The smell wasn't that potent but I loved the rosebuds that surrounded me in the bath. BUBBLEGUM LIP SCRUB: This scrub contains sugar crystals and moisturing jojoba oil in a Bubblegum flavour. Its so tasty! You're allowed to lick away any excess product once you've buffed your lips so it makes your lips feel soft and taste good - double whammy! What Lush products are you loving at the moment? I love that lip scrub as well - it tastes so good! My favourite Lush products are probably the It's Raining Men shower gel (which smells amazing), the 9 to 5 cleanser (which always makes my skin really soft) and the Daddy-O shampoo - it's like washing your hair with liquid parma violets!